Audio Not Working on Your Laptop? Over the years, I’ve had lots of issues with my laptop and one of the biggest problems has been the audio. Not sure why, but sometimes it would randomly just stop working. Sometimes a driver issue, sometimes Windows, sometimes hardware, etc., etc. On top of that, if you are trying to connect your laptop to external speakers or headphones, you could end up with more audio problems. In this post, I’m going to try and talk about the different possible reasons why audio may not be working on your laptop and what you can do to fix it. If you have tried everything below and still have issues, post a comment and we’ll try to help you out. As obvious as it sounds, you should probably check the volume controls in Windows and on your external speakers, if you are using those. It’s ridiculous how many times people accidentally press the mute button on their keyboard and then can’t figure out why there is no sound. Even though those keys are supposed to make muting your sound more convenient, I’ve found that it ends up causing more grief because people don’t realize what they just did. In Windows, click on the sound icon in your system tray and make sure there is no red circle with a cross going through it. Also, make sure to raise the volume bar to something higher if it’s very low. For external speakers, make sure you turn up the dial for the volume. Even if your sound is fine on the laptop, if the dial on the speaker itself is turned down, then you won’t hear anything. Also, make sure the speakers are properly plugged into the power outlet. Sometimes the connection on the back can become loose and you just need to push the power cord into the speaker. In addition, check the audio cable and make sure it is properly plugged into the speakers and the PC. The second simple check you want to perform is to make sure the sound in the program you are running is not muted. A lot of programs have their own volume control. For example, if you are watching a DVD movie, then the DVD player app probably has a sound control too! So you need to make sure that is turned up. Or if you’re watching a YouTube video, you need to turn up the volume in the YouTube player. As you can see, you can mute the volume for a video in YouTube. It won’t matter if your speakers are turned up, no sound will come through. So again, check the volume controls and then check that nothing is muted in Windows or in the app itself that is playing the audio. With Windows, you never know what problems the OS can cause itself. If you’re having audio issues, it’s always worth just restarting the computer once to see if that fixes the problem. A lot of times that’ll clear up strange issues that start to occur if your computer has been on for a really long time. Now for the more fun stuff. If everything is OK from above, then the issue may be more involved. The next thing to try is to check your sound drivers. Go to Device Manager (start, type device) and click on Sound, video and game controllers. First, we want to make sure that there is no yellow or red exclamation point next to the sound devices. If there is, you might be missing a driver. If there are no exclamation points, then you should still try to update your sound card drivers. The best thing to do is to see what manufacturer and model it is in Device Manager and then go to the website and download the latest drivers for your version of Windows. As you can see, you want to connect your speakers or headphones to the Line-out port. On the other hand, if you can’t hear anything through your computer speakers, it might be because you have something plugged in to the line out port. When something is connected to line out, it will automatically stop the audio from playing through the normal computer speakers. So depending on your audio problem, check the ports and make sure everything is connected properly. Also, if you have a video card that supports HDMI and you are using an HDMI cable to connect from your computer to your monitor that has built-in speakers, then your audio might be gone because the HDMI video card is not the default audio device. You can change this by going Control Panel and then Sound. Click on the Playback tab and look for a device that has the label “speaker” followed by the name of the device with the words HDMI in it. Choose it and then click on the Set Default button. This will ensure the sound is going through the HDMI cable to your monitor. Also, if you have a computer with a separate sound card, plus built-in audio on the motherboard, then you need to make sure the correct output device is selected on the Playback tab. Lastly, if you are connecting headphones and you can’t hear anything, but when you disconnect them you can hear sound through the internal laptop speakers, you have to go to the Playback tab in the above screenshot and set your headphones as the default audio device. Make sure you connect them to the computer first before opening the Sound Control Panel applet. If you don’t see the headphones in the list, right-click in an empty space in the list box and select Show Disabled Items. Click on the Find and fix playing sounds link first, followed by Find and fix problems with devices and hardware. These basically fix common sound and hardware problems on Windows PCs. It’ll save you some time in case it’s something simple. 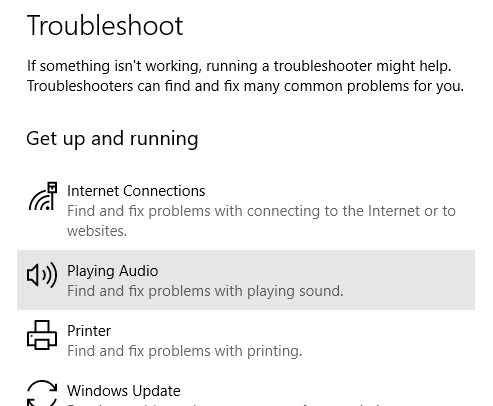 Also, Windows has a built-in troubleshooter for audio problems. Just click on Start, type troubleshoot and press Enter. At the top, you should see one called Playing Audio. Click on that to run through the troubleshooter. Some Sony and Toshiba laptops have an issue where you need to update the BIOS in order to get the sound working. This will occur if you upgraded your computer to Windows 7 or downloaded some updates and all of a sudden the sound stopped working. If nothing above worked, it could be an old BIOS. Go to the PC manufacturer’s site and download the latest BIOS for your computer. Another thing you can do is go into the BIOS and make sure that the sound card is Enabled. Sometimes the sound device gets disabled in the BIOS and therefore nothing you do in Windows will make any difference. The other thing you can try is to reset the sound device in Windows. You can do this by going to Device Manager and then right-clicking on the sound device and choosing Uninstall. Go ahead and restart the computer and Windows will automatically reinstall the sound device. This may fix your problem in some cases. Hopefully, the sound on your laptop or PC is working now! If not, post a comment with everything you’ve tried and your system specs and we’ll try to help! Enjoy! Why is the Default IP Address for My Router 192.168.0.1?